Her husband Kym Illman told the BBC they found some paper in the bottle but had "no idea" what it was until they took it home and dried it in the oven. "Tonya saw a whole lot of rubbish on the ground, and thought she'd help pick up some rubbish," Mr Illman told the BBC. Mr Illman said his wife passed the bottle "to our son's girlfriend, who saw what she thought was a rolled-up cigarette, and tipped it out with the sand". "Tonya tried to untie the string around the paper, but it was rather fragile, so we took it home and put it in the oven for five minutes to dry up the moisture. "Then we unrolled it and saw printed writing. We could not see the hand written ink at that point, but saw a printed message that asked the reader to contact the German consulate when they found the note." 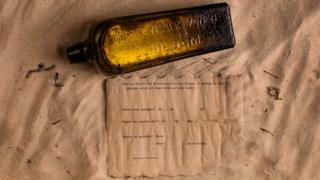 When they saw the date they thought it was "too far-fetched" to be real, Mr Illman said - but they researched the bottle online and took it to experts at the Western Australian Museum. "Incredibly, an archival search in Germany found Paula's original Meteorological Journal and there was an entry for 12 June 1886 made by the captain, recording a drift bottle having been thrown overboard. The date and the coordinates correspond exactly with those on the bottle message," Dr Anderson said. The bottle found on Wedge Island was found "mostly exposed without any form of cork or closure, and was about a quarter full of damp sand", and the bottle appeared to have lain "buried or mostly buried", partially filled with damp sand, Dr Anderson added. Media captionOver the last two decades, Harold Hackett has sent out over 4,800 messages in a bottle from the Canadian coast. Sand dunes in the area are quite mobile during storm events and heavy rain, so the bottle could have been subject to "cyclical periods of exposure" which could have led to the cork in the bottle drying out and becoming dislodged, "while the tightly rolled paper along with a quantity of sand remained inside preserved". "The narrow 7mm bore of the bottle opening and thick glass would have assisted to buffer and preserve the paper from the effects of full exposure to the elements, providing a protective microenvironment favourable to the paper's long-term preservation," the report added. WA Minister for Culture and the Arts David Templeman said he was "delighted" with the loan, adding: "It is truly an impressive find and thanks to the wonderful international and interdisciplinary cooperation of science and research, it can now also be shared with the world." Writing online, Mrs Illman described the find as "the most remarkable event in my life". "To think that this bottle has not been touched for nearly 132 years and is in perfect condition, despite the elements, beggars belief. I'm still shaking." Reporting by the BBC's Helier Cheung.